It’s been a challenge as the software does not stand still. 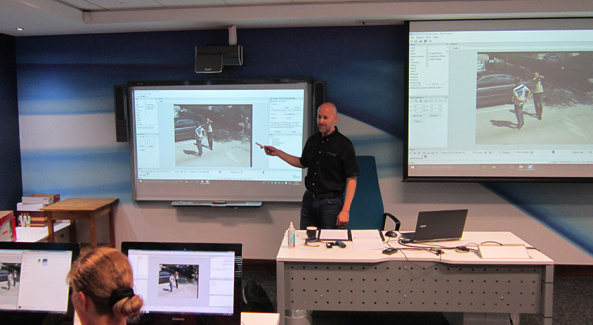 The evolving nature of Forensic Image and Video Analysis necessitates a constant update path so every training session is different. The core stays the same but more layers are added in every course. This was one of the reasons we had to increase Amped FIVE’s training to four days – there is just so much to squeeze in! The first day looks at the challenges with Digital Images and Video. The concepts discussed follow through the entire course and I always refer back to the initial theory when discussing enhancement techniques or case studies. From there – it is pretty much ‘hands-on’. It is so much easier to learn whilst doing and throughout the course there are always discussions about real, current cases. I have spent time with lots of great people and learned a lot myself. There may be different languages and legal requirements but the need for a forensic examination of images or video stays the same. Some people were just starting out in their Forensic career. Others were their country’s experts. As I start to prepare for the next round of training sessions, it’s time to say thanks to the people that I have spent time with, and I hope that you are enjoying using the software and have found it valuable in your analysis. We are preparing more training resources for users, so remember to subscribe to the blog and follow us on any of your chosen social media channels. If you require training for any of the Amped products, please contact us to ensure we can get to you as soon as possible… and if you already have training booked – I look forward to seeing you soon! Because of the large number of users and the demand for training in North America, we have developed the new Amped training facility in Henderson, Nevada. Training sessions there are led by our trainer Jim Hoerricks. In the meantime, here are a few snaps from my Amped Training Album.